Weight loss is a hot topic there’s no denying that. The world is a buzz trying to fix a population overrun with overweight people. You’d think that would be a good thing. However, many people actually lose sight of the intended goal…the real goal of enjoying a lean, strong and healthy body. So many so called fitness experts who are not qualified or with enough experience filling minds with lots of misleading information/advice on how people should exercise and diet. 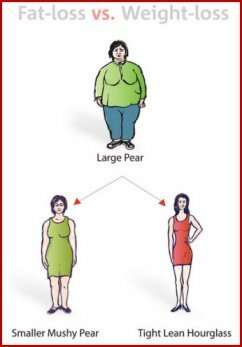 There are two terms that are used interchangeably in the weight loss world that cause further confusion: weight loss and fat loss. But they are not the same thing and in order for us to move ahead successfully we must focus on fat loss and ban the term “weight loss” from our vocabulary. Why? Losing body weight is not the key to that lean, strong, healthy body you are dreaming of. The focus needs to be placed on body composition (your muscle/fat ratio). So, what’s the difference between weight loss and fat loss? Weight loss: your ideal is to lower your body-weight; the sum total of your bones, organs, tissues and muscles as well as body fat. Fat loss: this is what you should be striving for to achieve your lean, strong energetic, healthy and vital body. It is the unhealthy body fat that is hindering your fitness goals. The end goal of any exercise program that consists of strength training is to burn off excess body fat while maintaining lean muscle mass. The more muscle tissue you’ve developed, the faster your metabolism burns fat…it simply operates faster. Your lean muscle is the indicator of how fast your metabolism operates. The idea is to gradually reduce your body fat levels as you keep your muscle tissue strong and intact. In order to accomplish this, you need a proper eating approach/plan every day that includes 4-6 small meals rather than 3 large meals and a strength training program that maintains strength and muscle tissue. The body is composed of numerous different types of weight. They all contribute in a different manner to your overall body appearance, weight and general health. Some people appear to be healthy because they may be ‘light’ weight wise but in reality they are in very poor health and their bodies sport flabby, soft and out of shape condition. If you have the opportunity, its best to get a qualified fitness professional to design an exercise program targeted towards the results that you want, otherwise you could spend hours exercising wrong and en up with very little to show for your hard efforts. If you stick with your ‘tailored to you’ exercise program for at least 12 months or longer (hopefully for life) you can be assured of sustaining long term fat loss. This means that soon you will be able to say hello to the body you will be enjoying the remainder of your life.